The Model 120 Piston Type Differential Pressure Gauge is CSA Certified to both the Canadian and U.S. Standards and U.L. Listed to the U.S. Standards. 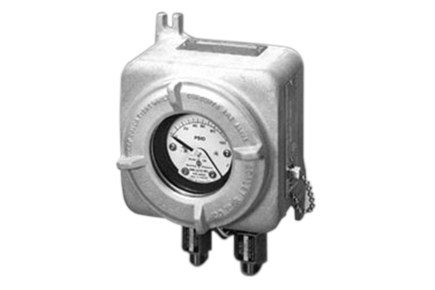 The entire gauge and the switch is enclosed in a rugged flameproof enclosure. The use of reed switch technology eliminates the need for an additional explosion-proof seal fitting within 18” of the enclosure. The Division 2 rated product is a lower cost alternative when compared to the Explosion-Proof designs that are often used in Division 2 applications. Certifications for Div I: CSA Certified, UL Listed, Class I, Division 1, Groups C, D; Class II, Division 1, Groups E, F, & G.
Certifications for Div II: CSA Certified, UL Listed, Class I, Division 2, Groups A, B, C, D; Class II, Division 2, Groups F & G.
Enclosure for Div II: NEMA 4X / Type 4 switch enclosure classification.